WEST VIRGINA: Anti-LGBT "Religious Liberty" License To Discriminate Bill Passes House By 72-26 Vote - Joe.My.God. 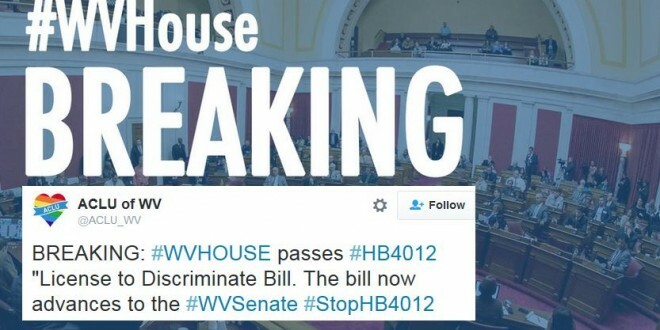 After hours of fiery and literally fist-shaking testimony in the name of White Jesus, West Virginia’s House of Delegates has voted 72-26 to pass a bill legalizing discrimination against LGBT citizens on the basis “sincerely held religious belief.” It appears that at least eight Democrats crossed party lines to vote with the GOP majority. The bill now moves to the state Senate where Republicans hold a slim two-seat majority. UPDATE: JMG reader Michael points out that SIXTEEN Democrats voted against us.